I didn’t used to like biking. Before I found a decent bicycle that fit me right. Before I had to rely on biking as my only means of transportation. Before I became accustomed to the sheen of sweat that coated my arms afterwards. Now, I don’t mind it so much. I enjoy it actually. Back when I was living in England, I had to bike everywhere. It was either that or walk (sloooooooow) or take the bus (muggy and wasting money better spent on books). Now, I don’t need to bike. Even though I’m still living in Europe, I have my international license and can drive wherever I want. But I still like to bike. I used to bike to the library once a week because it was less stressful than driving. Recently, I started a new job that requires me to leave the house, and I still like to bike there. Sure, there are hills. But it’s mostly downhill on the way home. Sure, I’ll take the car on days when it’s 94 degrees Fahrenheit. I don’t want to pass out. But I enjoy the feel of biking overall. even if it’s not typical. down the hillside or climb another. my helmet, secure my sunglasses. who cannot hear me anyway. stop and go and stop—STOP. heart beating away today’s stress? Let’s chat! What did you think of the poem? 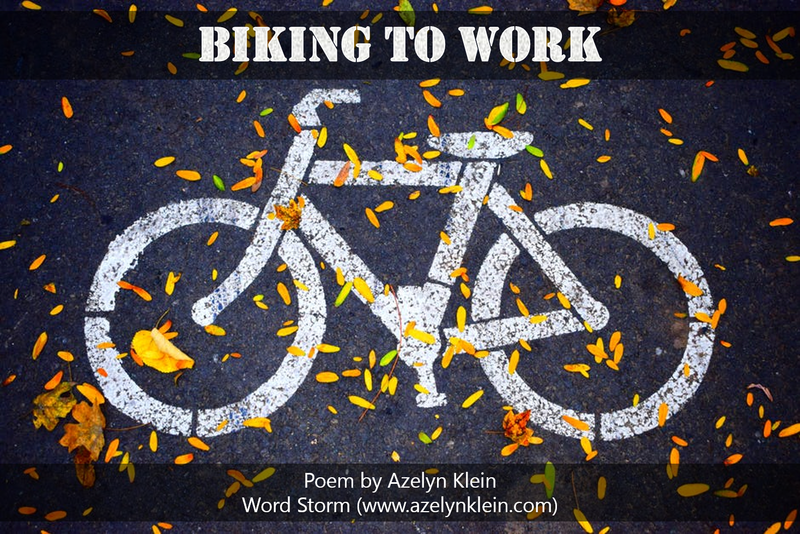 How do you get to work, or do you work from home? Do you enjoy riding a bike?